These soft mesh harnesses are durable and breathable made with added webbing that makes fitting it onto a pet quick and easy. The strong hardware ensures your pet is safe while wearing. They have a Choke Free Design which Pulls from the Chest ONLY. They also have a shape fit seam technology which causes the harness to conform to your dog's chest curve. 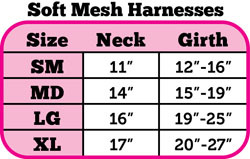 See sizing chart for the measurements.